Stan Brakhage’s hermetic lifelong cinematic mission has always been tinged with a mystical aura, sometimes to its detriment. 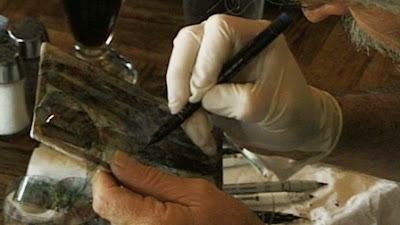 Brakhage encouraged this impression at times by speaking of a Muse in literal terms, claiming to serve as a conduit to a force that “gave” him his films. For those of us grounded in an empirical worldview, this talk of revelation inspires skepticism, to say the least. And when even the interpolation of the camera lens prevented him from getting close enough, he set it aside and began painting directly onto celluloid, scraping away obsessively at the film strip itself. In the case of “Mothlight” (1963), he pasted blades of grass and moth wings directly onto strips of perforated tape. At times eschewing the use of actors and even the camera, Brakhage’s work proved that there was nothing essential to the definition of cinema except for the act of seeing and if there is any unifying factor in his prodigious and diverse body of work (the 689 minutes of work included in this 2-volume set from Criterion barely scratches the surface, pun intended) it’s the emphasis on vision. Brakhage’s films share the same sense of purpose as the earliest actualities which celebrated the power of film to enable viewers to see moving images which were an attraction (to use Tom Gunning’s term) unto themselves rather than tools to convey a narrative. As with these actualities, most of Brakhage’s films were made without sound because he found it a distraction from the purity of the image and the viewer’s ability to perceive it. 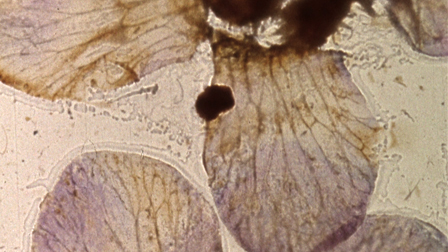 But unlike the early cinema of attractions, many of Brakhage’s films (at least those that were actually photographed) are heavily edited with some shots lasting no more than a few frames, his handheld camera moves freely intended, in some cases, to imitate the physical act of vision, the way that our eyes scan an object in a manner not much like the smooth pans and tilts of classical cinema. In this respect, Brakhage’s movies, worshipped by his cult followers, feature some of the elements often derided as “MTV style” or, more recently, “ADHD style” filmmaking. I admit to finding some of his work frustrating for this very reason. The instant a beautiful image sparks into vision, it is gone, or at least distorted, which, to my sensibility, doesn’t always facilitate the “act of seeing” or the kind of contemplative mood that his work induces for many viewers. But what his films do accomplish for me, and what I believe was one of his primary goals, is to encourage, no make that “require,” a whole new way of seeing, a naïve one like that of the imprisoned man-child in Werner Herzog’s “The Enigma of Kaspar Hauser” (1974) who literally sees the world for the first time and can only process it in bits and pieces, unsure which aspects to emphasize over others or what the “proper” perspective should be. It’s a pre-linguistic form of seeing, one not filtered by labels and acculturated filters; in other words, pure. 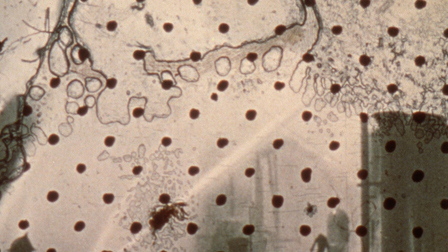 This is most aptly manifested in one of Brakhage's central works, “Scenes from Under Childhood” (a four-part film, only the first section of which is presented in this collection) in which he imagines first what a fetus might see or hear, and later tries to see the world through a baby’s eyes. What do colors look like when you don’t know what a color is? Does the infant see everything from a flat, objective perspective where all elements in the field of vision are given equal emphasis? As you can imagine, Brakhage’s film are difficult to digest in a single viewing which means that home audiences are afforded an opportunity that prior audiences, watching his films projected in campus auditoriums or at repertory theaters, seldom had. The short length of much of his work (some only a few seconds long, many in the 3-10 minute range) also facilitates multiple viewings of these richly textured films. At 689 minutes and spanning approximately fifty years, the set is not intended to be taken in at a single viewing or even over just a few days but to be gradually processed over time, and then revisited years later. Recognizing this, the producers of Volume Two of “by Brakhage” (Brakhage’s second wife Marilyn being one of the primary shapers of the collection) have organized the films into six separate programs, loosely organized by chronology though there is plenty of overlap: Program Two, for instance, covers 1967-1976 while Program 3 doubles back to cover 1972-1982. The flexibility of the Blu-ray enables viewers to choose their own path through Brakhage’s maze, and the films can be watched simply by timeline (everything on each disc packed into one “program”) or individually. Volume One, previously released by Criterion in 2003, is not organized by program and was also roughly organized in chronological order. BOULDER BLUES AND PEARLS AND . . . When Criterion released “By Brakhage, Vol. 1” in 2003, there was a question as to the wisdom of transferring Brakhage’s medium-specific work into a digital format. It was a move that he initially resisted but embraced for the first DVD release which came just a few months after his death. Transferring this 8 mm and 16 mm work (as well as the “direct” films that were made without a camera) into high-def may raise another set of questions, but the process was approved by Marilyn Brakhage and Criterion has certainly taken any ethical and aesthetic concerns under consideration in producing this package. Most of Brakhage’s films are silent. The nine films with sound are presented in Dolby Digital Mono that was “mastered at 24-bit from 16 mm optical and original full-coat magnetic tracks.” In the case of “Scenes Under Childhood, Section One” the film is presented with its original soundtrack as an option though Brakhage later preferred to screen the film, like the rest of the “Childhood” series, without sound. The Volume One Blu-Ray is identical to the Volume One SD released in 2003. The only extras are four “Brakhage on Brakhage” interviews in which the director discusses his work, each clocking in at nine minutes. Volume Two, Disc One includes three brief excerpts from the director’s salons. Brakhage held regular Sunday salon meetings at the University of Colorado at Boulder in which he would screen his work (sometimes for the first time) and lead a discussion. The three excerpts here run from 2-5 minutes each and were recorded by Phil Solomon. Disc One also includes a 1990 interview (an excessively fawning one, in my opinion) of Brakhage conducted by critic Marilynne Mason. It runs 37 minutes. Finally, there is an Audio Lecture from that is part of the Beckwith Lecture Series at the Museum School of Fine Arts in Boston, given on Oct 7, 1996. It runs 50 minutes. Volume Two, Disc Two includes two Salons and an Audio Lecture (66 min.) from an English class lecture given by Brakhage on Gertrude Stein’s poem “Stanzas in Meditation” at UC- Boulder on March 20, 1995. There are three more Brakhage on Brakhage interviews, running 6-7 minutes apiece. Finally, there is the touching “For Stan” (2009, 16 min. ), a film “lightly edited” by Marilyn Brakhage from footage of the director at work on his “Visions in Meditation” series in 1988. The chunky 92-page square-bound insert booklet features essays by Marilyn Brakhage and Brakhage scholar Fred Camper. Short capsules describing each of the films in both volumes are also included, an invaluable aid for anyone navigating this sprawling set. Mark Toscano also contributes a detailed essay about the challenges presented in transferring Brakhage’s films to a digital format. “By Brakhage” is one the most ambitious Criterion releases to date, matching in scale their epic versions of “The Human Condition” and “Berlin Alexanderplatz.” It’s a far more complicated release than either of those projects, however, covering nearly fifty years of work and compiling films produced in multiple formats. This massive set was made not only with a tremendous amount of research but also an obvious love and respect for perhaps the most admired avant-garde filmmaker America has ever seen. “By Brakhage” doesn’t exactly have a lot of commercial appeal and is unlikely to set any Criterion sales records, yet the amount of work they poured into it is staggering. This is a scholarly contribution of invaluable dimensions. 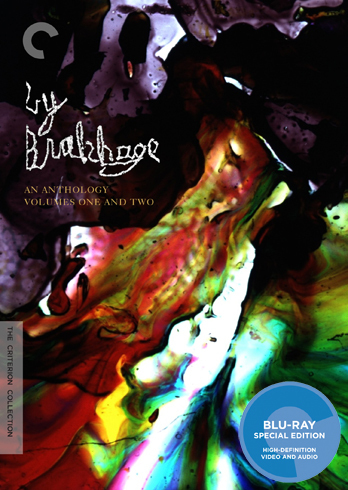 The 3-disc Blu-Ray set of “By Brakhage” includes Volume One (previously released on SD in 2003) and Volume Two, a total of 689 minutes running time. For those who already have Volume One, Criterion has also made Volume Two available separately on SD though it is not available singly on Blu-Ray. The Blu-Ray package currently sells at full retail for the same price as the two SD editions would cost separately. It’s a difficult decision for owners of the original SD release, and it’s hard to advise on whether the Blu-Ray is reason enough to pony up double the money to have the entire BR set instead of just adding the Volume Two SD. Then again, if you’re considering it, you’re probably a Brakhage devotee in which case the Blu-Ray will be awfully tough to resist.